The horror! Viv heading out to dine at Salade de Fruits without me!?!? I guess this is payback for all those times I've eaten without her. I knew this day would come. The plan was to drop her off at Salade to meet with her sis-in-law while I went home with the kiddies after the Stanley Park Christmas train. Well, on our way back along Beach Ave, I had a great idea. 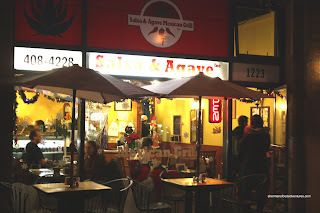 Why don't I stop by Salsa and Agave first? Yes, then I can pick up some food for myself! I always have a plan in my head to eat something and this was no exception. So I parked across the street and ran in to pick up a few things. A quick glance at the menu and I decided to try a Chicke n Torta and 4 Soft Tacos. So after the requisite pictures, I started to devour the torta (I was hungry) and it was pretty decent. 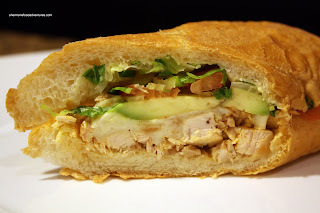 A good amount of roast chicken, refried beans, onions, tomato, avocado and mayo were wedged into the soft bread. It said something about jalapenos, but I honestly didn't taste any. It is a bit plain compared to the ones at Las Tortas; yet for only half the price ($5.00), it's a much better deal. 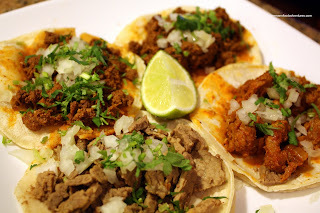 For my 4 tacos, I originally wanted to get one Lengua (tongue); but they were *GASP* sold out! No tongue for me tonight??? A bit disappointed , I went for one each of the Chirizo (Sausage) and Pastor (pork) with 2 of the Pollo (chicken). Despite the fact they were a bit cold by the time I bit into them, you would never confuse it with La Taqueria. I thought they were okay; but not anything special. It was all a bit bland to me and that included me adding plenty of pico de gallo too. By no means was the food terrible, it was fine. It just didn't live up to the hype, which can be a kiss of death when people have unfulfillable expectations. Agreed! My burrito was good, but not GREAT...and everyone thinks this place is great. I did try the burrito though....which isn't a big enough sample from their menu. Someone commented on my post suggesting me to try the soup. It's a place I would go back to, but it's not urgent or priority.